Flying back to Thailand was a good opportunity for us to experiment meditation. So we did an eight-day Vipassana meditation retreat at the Meditation Centre of the Doi Suthep Temple, located on a mountain that overlooks Chiang Mai. A truly rewarding experience! Feedback. No, meditation is not just about sitting without moving until you catch a cramp in your leg or squash the fly that makes TOO MUCH NOISE! Even though you’re not completely wrong, what is actually interesting is what happens inside your body. And meditation is well known for its many benefits on the body and mind. Just let’s see. Before sharing our experience, let’s give a short introduction about meditation as we generally don’t know much about it before practising. But of course you can skip it and read directly the 2nd part on our experience: “Eight days of Vipassana meditation: feedback”. To make it short, Vipassana meditation is a practice that consists in calming down the mind to evacuate the tension and negative thoughts that affect us in our daily life and make us unhappy. It helps us stopping dwelling on emotions such as envy, bitterness, self-depreciation, hate, etc. and producing good emotions in the brain. Our mind keeps naturally thinking all the time: we worry about the future; we dwell on the past, etc. Well, our mind wanders everywhere except in the present moment, far from what we called mindfulness. Vipassana means “clear-seeing”, in other words seeing things as they really are. Origins: where does it come from? Vipassana meditation is 2500 years old and is one of the most ancient meditation techniques of India. It was first discovered by the Buddha, who used it as a teaching for all the ills. Then, this technique progressively disappeared before being reintroduced in India in 1969. Concretely, what does it consist in? Meditation consists in concentrating one’s mind on what the body is doing in order to clean it from all the thoughts that flow into it. It is a bit of a “mental training” that requires regularity and perseverance, just as when you learn how to play a sport or a music instrument. This technique is within the reach of everyone. Scientific studies carried out with monks, who have been practising meditation for several decades, showed that it has a real impact on physical and mental health. During our retreat at the Doi Suthep Temple, we learnt the meditation as it was taught by the Buddha and as it is practiced by the monks. The teaching is led by a monk – the “Teacher” – but it is an individual practice. Everyone organises their meditation time as he/she likes. It is a personal learning. Two meals per day: breakfast at 7 am, lunch at 11 am. No solid food should be eaten after 12 pm. 5 am – Start of the day: we wake up and get dressed. We must wear white clothes (symbol of purity) as we are learners. 5:30 am – Dhamma talk: teaching given by the monk about life and how to live happy. It’s not about religion, but just food for thought based on the Buddhist philosophy of life. It is interesting and funny as the monk sprinkles his speech with anecdotes from the believers who visit him. Monks sometimes play a role of psychologists. 8 am – Morning meditation: three hours of meditation according to the last instructions given by the monk (first given on arrival and then during the daily reports). There are three meditation rooms: the ceremony hall, the meditation hall and the little temple. But we can also meditate pretty much everywhere (outside, in our room, in the hallways, etc.). 11 am – Lunch: A buffet serves rice with three or four Thai vegetarian dishes to be served in a compartment plate. After lunch, we have some free time to rest or do some cleaning. A small shop opens and we can buy functional products (toilet paper, washing powder, tooth paste, etc.) or more “luxury” ones (chocolate, soft drinks, etc.). It’s useful and soft drinks help to wait until breakfast the day after. 12:30 pm – Afternoon meditation: 5.5 hours of meditation interrupted by the daily report with the monk. It is recommended to have a 5 to 10 minute break between every cycle of meditation to stretch our legs (and stop this bloody cramp!). Between 1 pm and 2 pm – The individual daily report to the monk: It lasts 5 minutes. The monk gives new instructions to follow until the next report. It allows us to improve ourselves and get some reassurance when we encounter difficulties. 6 pm – Chanting: one hour of chanting Buddhist texts, in unison (or almost) with the monk. This is not a practical guide but only the instructions we got from the monk to start practicing meditation. Walking meditation consists of walking slowly in a straight line, eyes opened, focusing the mind on the foot that we move. After about 15 steps, we stop, turn around and walk back. And so on. At every step, we describe the movement in our head: “up, move, down”. When a thought comes to the mind, we stop it by saying three times what has distracted us, for example if it is a thought, then we say: “thinking, thinking, thinking”; a sensation: “feeling, feeling, feeling”; a noise “hearing, hearing, hearing”; etc. And then, we bring our mind back on our foot and we continue to meditate. Describing what we are currently doing enables us to force the mind to concentrate on the current action and thus avoid overthinking. We act consciously in order to reach the absolute present. We breathe from the belly and concentrate our mind on our breathing. As for the walking meditation, we describe in our mind what we’re doing: “inhale” when breathing in, “exhale” when breathing out. When a thought comes into the mind, same technique as for the walking meditation to reconnect the mind with the body. Day by day and as we are doing better and better, the monk gives us new steps. So after “inhale” and “exhale”, we have to think of our sitting position and of our body as a whole, and say in our mind “sitting”. Then, we point on different parts of the body (lower back, buttocks, knees, etc.) on which we have to push mentally, changing the point every time: “inhale” (breath in), “exhale” (breath out), “sitting” (sitting position), and “pushing” (mentally pushing on the first point). Etc. As time went by, the meditation length evolved. We started with 15 min. walking + 15 min. sitting meditation, until 30 min. each at the end of the retreat. The monk told us to do a 5-min lying meditation just before sleeping in order to calm down the mind and fall asleep more easily. While lying on the back, you just have to put the hands on the belly and think “inhale” (when breathing in) and “exhale” (when breathing out), then “lying” (while becoming aware of all the part of your body that is in contact with the mattress). These are some impressions on my first steps of my meditation learning during this retreat. I won’t share all my feelings in details because this is an individual and personal experience, and what we can feel when meditating is proper to each. In general terms, I haven’t had any difficulties to adapt myself neither to the planning (waking up at 5:00 am; going to bed at 9:00 pm) with only two meals a day, nor to the complete silence. Regarding my experience about learning how to meditate, I have progressed by steps. Bizarrely enough, as my mind was calming down, I had sleep disorders, and I realized that many of the other people had the same problem. I would wake up once or many times per night. As for the motivation, it varied. Some days (not many however), I didn’t feel like meditating, but when I forced myself motivation ended up by coming. Other days, I experienced very good sensations and I was over motivated. The first two or three days were the most difficult ones to concentrate because I started meditation from scratch. Everything can disturb, even a bird song is loud, and dog barks are irritating … Well, we lose all our bearings. Even the cushions gently touching the meditation mat could let a sigh out. Three, seven, or twenty-one days are learning steps. And after three days, I actually got the feeling to pass a milestone. After the fourth day, I started to feel more at ease while practicing meditation and to be less disturbed by noises and movements around me. It seems that my concentration improved. If at the beginning I really needed to pronounce the three words that help to take the mind back when it went away, then becoming aware of it was enough for the mind to refocus by itself on what the body was doing. I also noticed that my pace (breathing, walking, etc.) naturally slowed down and evolved into more conscious movements. What was incredible is that the first two days, I got tensions in my back after a few sitting meditations (you know those strong ropes crossing the upper back), certainly because of a bad position or a lack of experience. But then I had the satisfaction to feel those tensions vanish the days after, just by carrying on meditation. When I think that a one-hour Thai massage is sometimes barely enough to completely relax all the tensions, believe me, meditation is powerful! Without going too much into detail, my sensations increased as the days went by. I also observed that my concentration improved, my mind calmed down, and I felt more and more at ease when I meditated. I also felt the energy circulated throughout my body. Bizarrely enough, some days I got lots of ideas and desires, and a huge enthusiasm to realize them. Unfortunately, I could only calm down my mind, as I was not supposed to think too much. But it was an extremely positive and pleasant feeling. Starting meditation through an eight-day retreat was definitely a good idea (and I would have stayed ten days if we hadn’t had something planned just after) because it helps to progress quickly. We come through the hard and somehow demoralizing – although interesting – first step. Now I have been practicing meditation, I am convinced of its benefits. But I am also aware that it is a real training with all the investment and regularity that it implies. However, I sincerely think that it’s worth investing time and efforts because the results are extremely rewarding. This is a powerful technique that leads to a good life balance and helps to feel physically and mentally well, no matter what happens. Apart from that, it gives some keys to evolve at many levels of our own life, as well as strength to come through any difficult periods we may encounter. If you want to experiment a Vipassana meditation retreat, many centres offer some stays, mainly for a 10-day duration. The dhamma.org web site lists centres worldwide that offer Vipassana meditation retreats. The web site is well done and gives the availabilities for each. There are no fees covering accommodation, teaching and food, but it works on a system of donation to enable the other people to live the same experience. Doi Suthep Vipassana Meditation Centre’s web site: You’ll find here all the practical information about the meditation retreats at the Doi Suthep Temple. Send a request by email to doisuthepinfo@gmail.com, give your dates, gender (separate male and female dorms) and ask for availabilities. You will get an answer within a few days. No meditation experience is required. A passport and visa, which must be valid for all the duration of your stay. Some cash to buy soft drinks, washing powder, toilet paper, etc. at the little shop if needed. By saong-taa-ou (collective red taxis). It will cost you 50 bahts per person if the taxi is full. When you arrive, walk up the 300 hundred stairs to reach the temple, go on to your right, walk down the stairs to the meditation centre by following the signs. Arrive 30 minutes before to have enough time to get there. Not decided for a retreat? 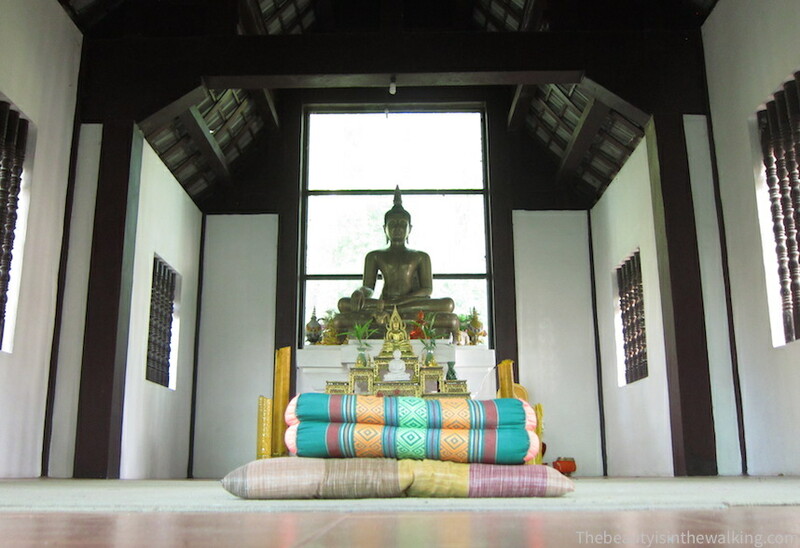 Try meditation in Chiang Mai for free. The Wat Srisuphan Temple offers free 1.5 hour-meditation initiation courses every Tuesday, Thursday, Saturday and Sunday at 7:30 pm. Have you tried meditation or do you practice regularly? What are the benefits you got from practicing meditation? Ah ah! :-D Actually, we weren’t allowed to do anything else than meditating, so that helped a lot! Thanks for sharing your experience. Good to hear that you feel the positive effects of meditation, even with a weekly practice. It’s hard work indeed, but it’s definitely worth it! This is really helpful! Did you look into other options besides this one? I am thinking about Wat Saun Mokkh in Surat Thani, but wanted to look into other options. Would love to know why you decided on this one/what others you considered! Thank you! Hi Karley, Sorry for answering late. We were on the road again… ;-) Actually, we considered a few options but not that many. We were looking for an authentic place in Thailand like this meditation centre in the temple (and not a private wellness centre as there are many in Thailand), that was easy to reach from Bangkok. Then I read an article about someone who experienced a meditation retreat there and it sounded very much similar to what we were looking for. What I read about this temple then finished to convince me that it was the right place for us, and it was. Of course, there are other places like this in Thailand and around the world (I give a link at the end of the article btw). I didn’t know the one you mention, but it might be also a good one. Maybe look for some feedbacks on the Internet to see if it is serious. But if this is in a temple, it should deliver a good and authentic practice normally. Good luck with it! And feel free to give us your feedback afterwards. Thanks for visiting us! I would also like to do the Doi Suthep vipsana course, but do you advise the 7 days course or the 10 days course? Do you think those extra 3 days make a difference? Well, it depends of your interest in meditation. It can be challenging to start with a 10-day retreat if you just want to discover what it can be. But if you really want to experience meditation and get into it, then go for 10-day retreat. There are several stages in learning meditation: 3 days, 7 days… So after 7 days you kind of step into a different level of practice if you take it seriously.